This is a United States territorial acquisitions and conquests list, beginning with American independence. Note that this list primarily concerns land the United States of America acquired from other nation-states. Early American expansion was tied to a national concept of manifest destiny. The Louisiana Purchase in 1803, was negotiated with Napoleon during the presidency of Thomas Jefferson; the territory was acquired from France for $15 million (equivalent to $245 million in present-day terms). A small portion of this land was ceded to Britain in 1818 in exchange for the Red River Basin. More of this land was ceded to Spain in 1819 with the Florida Purchase, but was later reacquired through Texas annexation and Mexican Cession. Mexican Cession lands were captured in the Mexican–American War in 1846–48, and ceded by Mexico in the Treaty of Guadalupe Hidalgo, where Mexico agreed to the present Mexico–United States border except for the later Gadsden Purchase. The United States paid $15 million (equivalent to $394 million in present-day terms) and agreed to pay claims made by American citizens against Mexico which amounted to more than $3 million (equivalent to $79 million today). In the Gadsden Purchase of 1853, the United States purchased a strip of land along the Mexico–United States border for $10 million (equivalent to $294 million in present-day terms), now in New Mexico and Arizona. The territory was also bought as Americans were passing through the land west to California. After the American Mexican War, over the dispute of border claims, American bought the land to prevent future conflict. Few historians would argue the territory was intended for a southern transcontinental railroad. Alaska Purchase from the Russian Empire for $7.2 million (2 cents per acre) on March 30, 1867 (equivalent to $126 million in present-day terms), as a vital refueling station for ships trading with Asia. The land went through several administrative changes before becoming an organized territory on May 11, 1912, and the 49th state of the U.S. on January 3, 1959. Puerto Rico, Guam, and the Philippines (for which the United States compensated Spain $20 million, equivalent to $588 million in present-day terms), were ceded by Spain after the Spanish–American War in the 1898 Treaty of Paris. Spain relinquished all claim of sovereignty over Cuba, but did not cede it to the United States, so it became a protectorate. All four of these areas were under United States Military Government (USMG) for extended periods. Cuba became an independent nation in 1902, and the Philippines became an independent nation in 1946. The naval base occupies land which the United States leased from Cuba in 1903 "... for the time required for the purposes of coaling and naval stations." The two governments later agreed that, "So long as the United States of America shall not abandon the said naval station of Guantanamo or the two Governments shall not agree to a modification of its present limits, the station shall continue to have the territorial area that it now has, with the limits that it has on the date of the signature of the present Treaty." 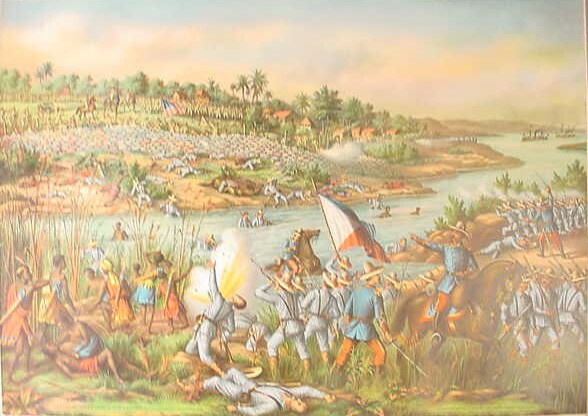 On July 25, 1898, during the Spanish–American War, Puerto Rico was invaded by the United States with a landing at Guánica. As an outcome of the war, the Jones–Shafroth Act granted all the inhabitants of Puerto Rico U.S. citizenship in 1917. The U.S. granted Puerto Ricans the right to democratically elect their own governor in 1948. In 1950, the Truman Administration allowed for a democratic referendum in Puerto Rico to determine whether Puerto Ricans desired to draft their own local constitution without affecting the unincorporated territory status with the U.S. A local constitution was approved by a Constitutional Convention on February 6, 1952, ratified by the U.S. Congress, approved by President Truman on July 3 of that year, and proclaimed by Gov. Muñoz Marín on July 25, 1952, the anniversary of the 1898 arrival of U.S. troops. Puerto Rico adopted the name of Estado Libre Asociado (literally translated as "Free Associated State"), officially translated into English as Commonwealth, for its body politic. The United States Army Military Government in Korea (USAMGIK; Korean: 재조선 미육군 사령부 군정청; Hanja: 在朝鮮美陸軍司令部軍政廳) was the official ruling body of the southern half of the Korean Peninsula from September 8, 1945 to August 15, 1948. ↑ Samuel, C. Hyde Jr (2010). "Consolidating the Revolution: Factionalism and Finesse in the West Florida Revolt, 1810". Louisiana History. 51 (3): 261–283. ↑ Ireland, Gordon (1941). Boundaries, possessions, and conflicts in Central and North America and the Caribbean. New York: Octagon Books. p. 298. ↑ "Treaty Text from the Avalon Project". Retrieved November 7, 2006. 1 2 Boggs, Samuel Whittemore (1940). International Boundaries: A Study of Boundary Functions and Problems. Columbia University Press. p. 48. Retrieved 2013-04-27. ↑ "U.S. Insular Areas: Application of the U.S. Constitution" (pdf). Report to the Chairman, Committee on Resources, House of Representatives. United States General Accounting Office. November 1997. Page 39, footnote 2. ↑ Miller 1984, p. 163 "... Will Show No Mercy Real Warfare Ahead For Filipino Rebels Kitchener Plan Adopted The Administration Weary of Protracted Hostilities.' The reference to Kitchener made eminently clear MacArthur's intent, as the British general's tactics in South Africa had already earned ..."
1 2 "Good Neighbor Policy". Retrieved 6 October 2014. ↑ "Agreement Between the United States and Cuba for the Lease of Lands for Coaling and Naval stations". The Avalon project, Yale Law School. February 23, 1903. Archived from the original on June 27, 2007. Retrieved 2007-06-20. ↑ "Treaty Between the United States of America and Cuba". The Avalon project, Yale Law School. May 29, 1934. Archived from the original on June 27, 2007. Retrieved 2007-06-20. ↑ Act of July 3, 1950, Ch. 446, 64 Stat. 319. ↑ Constitution of the Commonwealth of Puerto Rico – in Spanish (Spanish) Archived 2011-11-14 at the Wayback Machine..
↑ Constitution of the Commonwealth of Puerto Rico – in English (English translation). ↑ International Boundary and Water Commission. "Minutes 144" (PDF). Archived from the original (PDF) on 2016-03-08. Retrieved 2015-06-12. ↑ International Boundary and Water Commission. "Minutes 158" (PDF). Archived from the original (PDF) on 2016-03-08. Retrieved 2015-06-12. ↑ Mueller, Jerry E. (1975). Restless River, International Law and the Behavior of the Rio Grande. Texas Western Press. p. 64. ISBN 9780874040500. ↑ Decisions of the Department of the Interior in cases relating to the public lands: 1927–1954. United States. Department of the Interior. Washington. For sale by the Superintendent of Documents, U.S. Government Printing Office. pp. 25, 337. Retrieved 2013-07-25. 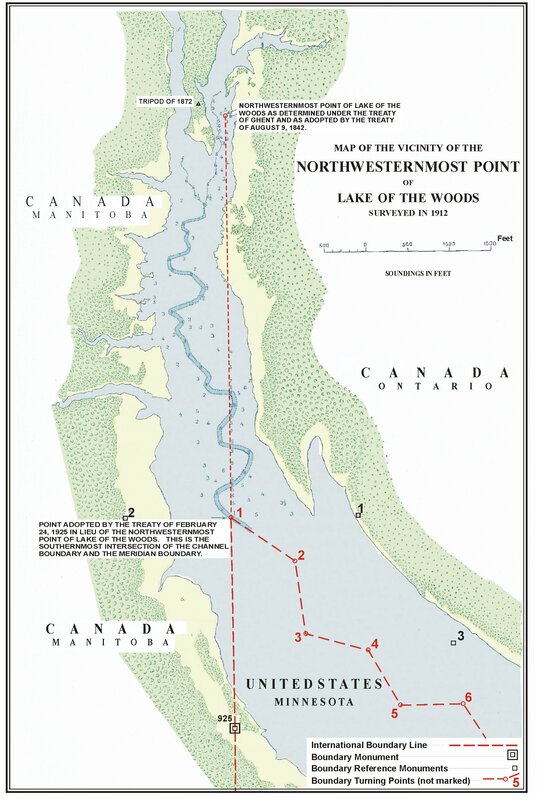 ↑ "Map of the vicinity of the northwesternmost point of Lake of the Woods". Retrieved 2013-08-19.